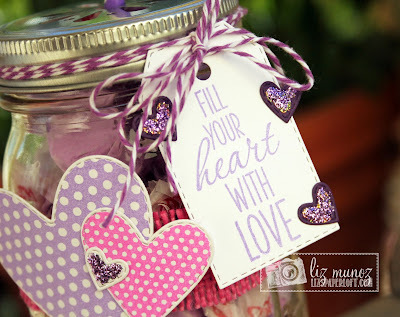 Liz's Paper Loft: MCT ~ Sneak Peek Day 2 ~ Fill Your Heart! Welcome to Day 2 of My Creative Time! 29th Release! Wasn't yesterday's "sneaks" just FABULOUS!!!! I'm in such awe of all the talent on our team and am so blessed to be in such great company! Today I wanted to share with you a super quick and easy gift. This is the kind of gift that could be used for teachers, coworkers, or even your kids. "Stitched Round Tab, Arrow and Tag Dies"
Now for the fun stuff!!! Just like always, Miss Emma is very generous with her giveaways. So be sure to read so you don't lose out! ***Sneak Peek giveaway! *** We will be giving away the sets we are showcasing each day to ONE lucky winner! For example, the set we are showcasing on Wednesday, Emma will announce the winner of that on Thursday & the sets we are showcasing on Thursday, Emma will announce that winner on Friday in her video! ALL you have to do is leave a comment on each of our blogs! You are NOT required to comment on EVERY SINGLE blog, but the more you comment on, the better chance you have for winning! VERY IMPORTANT, PLEASE leave a way for us to contact you w/your comment just in case "YOU" are the lucky winner! For EXTRA entries, you can spread the word about this release on Facebook, tweet about it OR even instagram it! #mycreativetime! GOOD LUCK EVERYONE & let's start spreading the word! **EXCITING NEWS** Since Emma didn't get to celebrate her 3rd year Anniversary in December (2013), she decided to celebrate it this month w/an EXTRA SPECIAL "FREEBIE" for THIS WEEKEND ONLY! YEP, for the FIRST TIME, the freebie will be a "DIE & a stamp"! So, you will get THIS ADORABLE set in your packages w/your purchase for THIS WEEKEND ONLY starting Fri, Jan 17th thru Sun Jan 19th ending at midnight PST! If you miss out on it, Emma will have it available for purchase in her store on Mon. Jan 20th! Don't forget to check out what the other girls on the Design Team have created. Remember we have a new Design Team, be sure to show them some bloggy love! I'll be back tomorrow with a new Sneak Peek! Very cute!! Love the colors, the heart punches work great!! Amazing job!! Luv love this idea, I luv mason jars...where did you get the lid??? What a great idea! Really adorable! Super CUTE Valentine's day project Liz! LOVE the color combo and how you used the new stamps and dies! What a cute presentation for a candy gift. Very cute idea, love the soft colors all put together. Oh Liz your Mason Jar idea is adorabs!! I love how you chose to fill it. 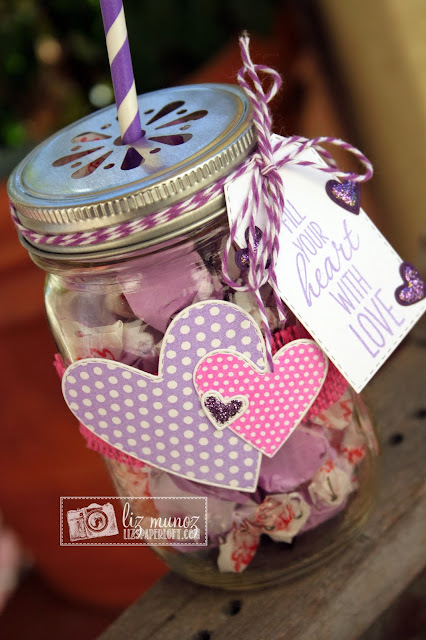 Your ideas on how to use Miss Emma's sneaky peek day #2 goodies is so cute and precious. I love all of your ideas always you are just such the clever gal. I so can't wait to get all these goodies I'm so excited about them and so many neat ways to use them. Thanks for your sweet inspiration. What an adorable little gift, Liz! I love all of the elements you added! That burlap is awesome! Definitely a perfect teacher's gift! Your are right that would be a great teacher gift-super cute! a great teacher or co-worker gift! gotta love those stickles!! This really makes a gorgeous gift...so pretty! What a super sweet gift! Love it in purples! What an adorable project it's a perfect gift! Super cute gift!! Love the glitter on the hearts! Absolutely adorable idea Liz! 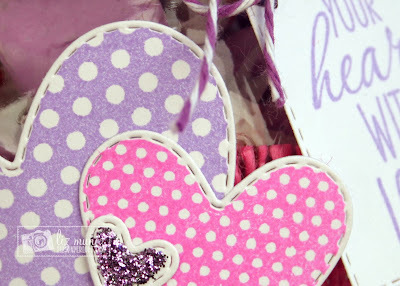 I love the touch of pink burlap, fun little hearts and adorable tag! Your right, this would be perfect for about anyone! Great gift idea! Great job of showcasing the wonderful stamps and dies! Cute project! Love the stitched heart dies! Love the project. Anyone would love to get a gift like this. GREAT idea! I have some of these jars I bought before Christmas and I haven't used them yet. Guess what the kids are getting for Valentine's Day! What a beautiful gift. I may have to steal your idea when I make Valentine's gifts for my co-workers. They will love them. Thanks for sharing. Liz ~ What a BEUATIFUL gift idea! I LOVE it! Adding all those details and the bling totally won my heart! Need to lift this idea for Ryan's teacher! Thanks for always inspiring! Love quick and easy gift ideas. Cute gift! Miss Liz - I love this project. Beautiful decor for this V-Day gift. Thank you for sharing your day 2 sneak peek project. ~ Carol W.
Absolutely in love with your creations here! Spectacular showcase of the new release...the polka dot hearts...swooon! This is such a cute, fun idea!! Fabulous Valentine jar. I love the idea and how you used the dies and stamp set very creative. Your jar is adorable, thanks for sharing. What a wonderfully decorated gift - love the purple colors. Oh I love this adorable Valentine jar Liz!! And the best way to dress it up? To use MCT products! Loving these hearts...ok you got me, I am loving it all! This is a great idea for a teacher's gift!! Love it!! These heart dies are great!! Great project with non-traditional valentine's day colors. I love the colors! Fabulous project!!! Super cute jar. Great idea. FANTASTIC!!!! I LOVE THE COLORS!!! I LOVE THE OVERALL DESIGN and CONCEPT!!! WELL DONE!!! I want one....hehehe... Too cool.... Tfs. What a cute project, Liz! Aww, your hearts make the jar look so sweet! Great job. The Stickles look great on your sweet gift jar. The hearts and tag are so pretty! Love your project. Wonderful job! Fun idea for a gift or storage. I love making gifts like this and this one turned out so FUN and PERFECT! Love the heart dies! Absolutely everything about this jar of love, is beautiful! Great idea too! !